I don’t know if it’s because oil is staying stubbornly above $60, or because it’s just that time of year, but the annual spectacle over the influence of evil oil speculators is once again under way. Only this time, it will have real consequences. In a three-day series of hearings this week, the Commodity Futures Trading Commission (CFTC) heard arguments about the influence of speculators on the oil and gas markets, and considered new trading limits. It now seems inevitable that some sort of new technical limits will be imposed on the size of positions traders can hold, how they can be traded, and by whom. In particular, the Commission has set its sights on chasing out purely financial speculators who don’t need the contracts to hedge their own business needs (for example, airlines hedging the future price of fuel) or who don’t intend to take delivery of the commodity (for example, refiners who bid for crude oil). A new CTFC rule was applied this week, setting position limits and accountability levels on the trade of natural gas contracts on the Intercontinental Exchange (ICE). Some traders had used the ICE to skirt stricter limits on the NYMEX exchange. NYMEX also moved to set more conservative limits on the size and timing of its trades, presumably as a preemptive attempt to ward off further incursion by the CFTC into its activities. In turn, the United States Natural Gas Fund (NYSE: UNG), by far the largest fund providing exposure to the natural gas futures market, announced on Wednesday that it would reduce its position in the ICE. The fund’s holdings in the ICE have indeed been huge, comprising anywhere from 60% of the fund (according to brokers Raymond James) to 80% (according to rumor). The fund has been bursting at the seams with incoming capital, having recently hit its limit on buying more contracts, and is currently awaiting the decision of the SEC on its request to issue up to another billion units. The fund lost 3.26% on the day in reaction. Naturally, the commodity trading world erupted in cries of outrage, with analysts fussing over the prospect of reduced liquidity, poorer price discovery, and the possibility that the new rules would force the trade into less regulated over-the-counter markets. Methinks the ladies doth protest too much. For one thing, when we’re talking about commodities like oil, which trades over 84 million barrels per day on a global scale, I have little patience for the liquidity argument. As for price discovery, it seems to work just fine at lower levels of volatility. And the CTFC is already seeking new authority to regulate the OTC markets. CFTC Chairman Gary Gensler holds the more regulated agricultural markets out as an example of how the energy markets should work. Let’s take a look at that thesis. In a nutshell, what the CFTC seeks to is dampen the volatility of the oil and gas indexes so that those green and red lines run a little closer to the blue line. I have no problem with that. In the real world, severely oscillating prices for critically important stuff like oil and gas affect the entire economy, and the extra froth that speculative traders add to the market wreaks real damage. When prices for oil and gas rise too high, too fast, they take a big bite out of everything from wages to steel production. And when they fall too low, too fast — as they did this year — it kills drilling and productio. This results in less supply in the future, and increases the likelihood of future price spikes. A few percent difference in the range of overshoot and undershoot has outsized effects. For such critical commodities, it makes a certain amount of intuitive sense that those who intend to actually take delivery of the stuff should dominate the trade, not financial institutions. Commodities shouldn’t be treated as just another asset class when their volatility literally means life or death for people and whole sectors of the economy. Less volatility would also offer better visibility for investment in future supply, which is crucial at this time. Furthermore, the overweening influence of big banking and hedge fund money is now roundly proven to be a real danger to the health of the economy. Let them cry and moan. . . they have no legs to stand on, and they need to be cut down to size. On the other hand, it also seems obvious that had oil only risen to $125 a barrel last July instead of $147, it wouldn’t have made consumers much happier. The damage would have been a little more limited, but not enough to stop the juggernaut of massively deleveraging markets, and not enough to win a congressman more popular kudos. Less volatility also means higher lows. 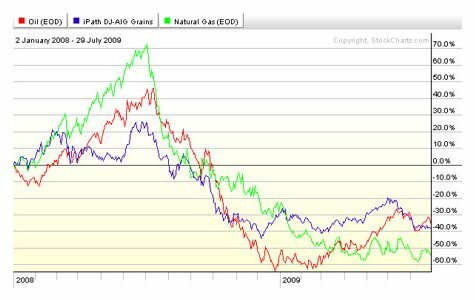 Were the oil and gas trade as moderate as the grains trade, we would not now be looking at $3.60 natural gas, but maybe something closer to $4.50. In turn, we would now have higher prices for grid power, petrochemicals, fertilizer, basic metals and building materials. And oil prices might be more or less exactly where they are now, having seesawed to their lowest and highest points, to find some equilibrium again in the $60s. In all, more controlled speculation will likely offer small satisfaction to consumer cost advocates. Even so, I applaud the CFTC’s effort. Tighter regulation will hopefully put to rest the blathering of pandering lawmakers and the shrieks of uninformed consumer advocates, and let the market get on with its business of price discovery and moving capital where it is needed. There is damage done by uncertainty, too. . . just ask UNG about what it has cost them to be in limbo under a fog of CFTC rumors. Then the next time that oil and gas prices spike, perhaps we can have an intelligent discussion about fundamental reasons, like peak-oil induced supply limits and the role of the dollar. We might finally see that the economy is simply bumping its head against a descending ceiling of supply, instead of running off on another useless hunt for scapegoats. Once the sound and fury over bogeymen speculators subsides and lawmakers start getting their heads around the real problems, we can have a serious dialogue about how we’re going to navigate our energy future. Energy analyst Chris Nelder examines the relationship between oil prices and the U.S. dollar, the yen carry trade and the credit market, and concludes that we must be near a floor for oil prices. Energy analyst Chris Nelder takes a look at peak oil as a “black swan” event, and finds an excellent opportunity to go long oil in the disconnect between the conventional wisdom of the market and the reality of energy supply.